Panelization is a procedure used to handle PCBs which would otherwise be too small to process. A number of identical circuits are printed on to a larger board (the panel) which can then be handled in the normal way. The panel is broken apart into individual PCBs when all other processing is complete. Separating the individual PCBs is frequently aided by drilling or routing perforations along the boundaries of the individual circuits, much like a sheet of postage stamps. Another method, which takes less space, is to cut V-shaped grooves across the full dimension of the panel. 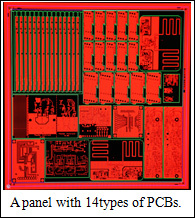 The individual PCBs can then be broken apart along this line of weakness. Panelization is a necessary step to optimize the production process and minimize the cost, both for high-volume and small-volume production. For high-volume production, a number of identical small PCBs are paneled on to a larger board. For small-volume production and samples, many manufacturers make the same panelization as high-volume production. For Sunthone, we have a special method to do the panelization of samples production. We sort all sample orders with same specifications, and panel them together on a larger board(the panel), which means this panel may includes a number of different types of PCBs. The following processes are done in the same way as high-volume production. This is the key advantage that Sunthone manufactures sample/prototype PCBs in a quick turn and competitive price.